Upon arrival connect for your flight to the Algarve. This area, known for its incredible beaches, Mediterranean like climate, cuisine and night life, is the perfect vacation for those who enjoy life! Pick up your car rental and drive to your hotel. 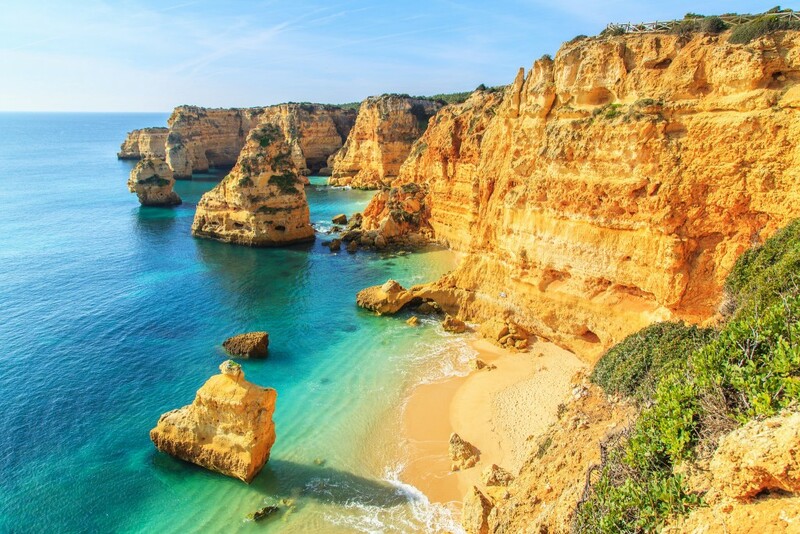 The Algarve coastline is 135 miles long and made up of spectacular long golden beaches punctuated with unusual rock formations, grottoes and coves. As the last stronghold of the Moors, their influence can be seen everywhere in the whitewashed houses, chimneys and narrow winding streets of the villages and towns. Days to relax and enjoy the beach. Feel the warm sand under your feet! Close your eyes and be lulled by the sound and smell of the sea! Drive along this magnificent coastline visiting its many towns along the way. Costa Vicentina is perfect for sports such as surfing while the west side, the Barlavento, with its magnificent caves is ideal for a relaxing boat ride and the east side, the Sotavento, for swimming, windsurfing and jet sking. Spend a day at the zoo, a theme park or a water park. Visit the fantastic marinas of Vilamoura and Lagos. Enjoy the non-stop vibrant night life – sea side bars and outdoor cafes and restaurants! Drive to the airport to drop off your car. Fly to Lisbon to connect to your flight home.